￼￼Plan the attack and command your soldiers through two phases of combat. Open fire on your enemies, utilise tactical abilities and unleash psychic powers to crush your foes. Fight your way through violent single and multiplayer battles to destroy everything that stands between you and certain victory. ￼￼Sharpen your tactics in both single and multiplayer games based on traditional chess rules, executing brutally violent kills in dramatic battlefield terrains. Select your race and go to war online against opponents from all over the world in the fully cross­platform multiplayer mode. 50 mission single­player campaign: Join Captain Dracomedes as he fights for Hethgar Prime with the Sons of Sanguinius in the 50 mission, fully­narrated campaign: The Angels of Death. This is only the beginning. The universe spans untold galaxies to conquer. This is not just war. This is REGICIDE. Broadband Internet Connection required for Multiplayer and User Account functionality. 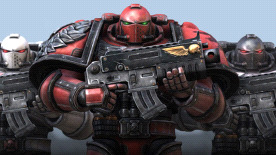 A Warhammer 40,000: Regicide User Account is required to use the game's online services. The game's single player Skirmish mode is playable in offline mode.